"Contradiction #7: Tower of Babel before the Flood"
7. 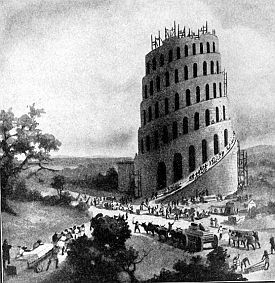 WAS THE TOWER OF BABEL BUILT BEFORE THE FLOOD? EGW: YES "This system was corrupted before the flood by those who separated themselves from the faithful followers of God, and engaged in the building of the tower of Babel" (Spiritual Gifts, vol. 3, p. 301). BIBLE: NO "After the Flood ... they said, "Come, let us build ourselves a city, with a tower that reaches to the heavens, so that we may make a name for ourselves and not be scattered over the face of the whole earth" (Genesis 9:28 and 11:4). NOTE: This was one of the first EGW contradictions that SDAs found and corrected. They claimed it was just a typographical error, forgetting that EGW claimed every word she wrote came from God! (Spiritual Gifts, vol. 2, p. 293). We don't quite understand the point Sanders is trying to make. Whether Ellen White said that every word she wrote came from God or not, what does that have to do with a printer's typographical error? Being here reproduced photographically, the pages carry with them, of course, such typographical errors as occurred in the first printing. One outstanding case of this kind will be noted in Volume III, p. 301, in line 4 of the last paragraph, where, through a printer's error, a comma and the word "and" were inadvertently omitted, creating a seeming historical discrepancy in an incidental reference, which has given some careless readers, who wholly ignored the plain teaching of the earlier chapters, an opportunity to declare that the book teaches that the tower of Babel antedated the flood.—preface to 1945 reprint of vols. 3 & 4, Spiritual Gifts, bold added. Did Sanders read the book for himself before he decided to accuse Ellen White? Or is he taking someone else's word for what it says? The above preface said, "who wholly ignored the plain teaching of the earlier chapters." It is true that the book as a whole clearly teaches that the Tower of Babel was built after the Flood, since it devotes entire chapters to both Babel and the Flood. Thus, it seems more than plausible that the typographical error came from the printer. Perhaps Sanders has a copy of the original manuscript that would prove otherwise? They claimed it was just a typographical error, forgetting that EGW claimed every word she wrote came from God! (Spiritual Gifts, vol. 2, p. 293). Sometimes the things which I have seen are hid from me after I come out of vision, and I cannot call them to mind until I am brought [p. 293] before a company where that vision applies, then the things which I have seen come to my mind with force. I am just as dependent upon the Spirit of the Lord in relating or writing a vision, as in having the vision. It is impossible for me to call up things which have been shown me unless the Lord brings them before me at the time that he is pleased to have me relate or write them. It has been a matter of great perplexity to me to know what course to pursue with messages given me for individuals. I have often written messages of reproof for different ones, and given them to these persons, and they have laid them away, and have said nothing about them. Their course has shown in many instances that they were not affected by the messages, and they have continued to have a bad influence in the church, who were ignorant of the reproof given. My course is now clear to wrong the church no longer. If reproofs are given I dare not commit them alone to the individuals to be buried up by them, but shall read what the Lord has seen fit to give me, to those of experience in the church, and if the case demands, bring it before the whole church. The great delicacy which some have manifested lest others should learn that they have been reproved, proceeds from a lack of humility, and unwillingness to acknowledge their wrongs. [p. 294]—Spiritual Gifts, vol. 2, p. 293. We have two possibilities. Either Sanders made a typo in the giving of that reference, or worse yet, he made a typo when he said that Ellen White wrote that she got every word from God. If the first suggestion be the correct one, we honestly don't have a clue where to find any such statement by Ellen White. We have yet to run across anything like that in our research. If the second possibility be the correct one, then we have the unfortunate case of a typo being slanderous. Back in 1999, we went to see a gentleman who had run across Robert Sanders' "Contradictions" document. In the course of our conversation, he said that Ellen White said that every word she wrote came from God. We handed him Spiritual Gifts, vol. 2, and said, "See if you can find it." There was a long silence as he read and read. Finally, he said, "It's not there." Hopefully it won't be too many more years before Sanders fixes this typo. "Tower of Babel before the Flood": what do you think? I believe Ellen White really did contradict the Bible on this point, and put the Tower of Babel before the Flood. My opinion is that the printer is the one who made the mistake by leaving out some text and punctuation. I found the mystery quote where Ellen White said that every word she wrote came from God. I'll email it to you. Really, if Sanders is going to get bent out of shape over typos, he should fix his own typos. I can't understand it.